Mike Molloy and Tommy McNamara were the “Twin Terrors of the Western Front”. They flew as if they had been born in Spads, they drank like thirsty whales, and they’d fought by each other’s side through every mile of air along the lines and in every bar from the Front to Paris. If there were no more pressing targets, they pounded each other to a pulp, for any reason at all, and were strangely happy. Leading the 24th Pursuit Squadron across WWI Europe’s blood red skies, Molloy and McNamara were the bane of the German Air Force. Their names and reputations were known wherever fighting men met with blazing guns or flying fists. 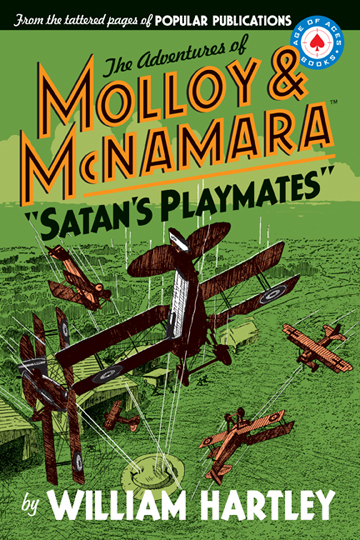 Written by William Hartley, the twenty tales of Molloy and McNamara appeared in Dare-Devil Aces between 1936 and 1942. Age of Aces has collected the first eleven of them for this volume.